This bookmark-slash-pendant features an intricate cutwork design rendered in sterling silver. 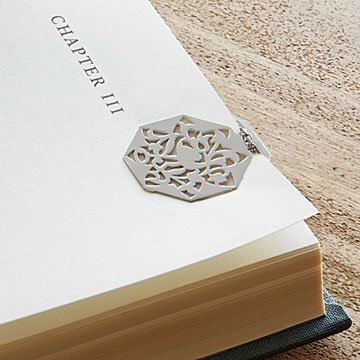 Read all about it—this handcrafted pendant doubles as a fully functional bookmark. Simply slip the chain on or off depending on whether you're accessorizing or page-saving. Puja Bhargava Kamath crafts the elegant cutwork design from sterling silver, giving it a look that's sure to impress— be it nestled among your everyday necklaces or between the pages of your favorite book. Handmade in India.